We live in a supercharged world of technology. Moving at a breakneck pace. How can you make sure kids keep up with this pace, when all they want to do is have fun? We believe that gaming is the key. Before the locked down systems of X-Box, SNES and the Playstation 1, PC gaming dominated. Back in the day, people were able to modify these games, re-imagining them in their own image. We started the EduCubed project with this in mind. Creativity helps kids learn things that they wouldn’t bother learning otherwise. EduCubed takes advantage of the highly customisable nature of Minetest, an open source sandbox style game. It’s base is an open world block building game that many of us may be familiar with, however the base game can be modified with custom lua scripts. There is a huge range of community created mods already available, or you can create your own. You can find out more about Minetest here. The sandbox style of the game means that it’s uses are not simply limited to recreation. In the case of EduCubed it has been applied as an educational tool with great potential. For example, instead of a student presenting an assignment solution as a poster or a physical model, they could use the building blocks in the game to construct a virtual model. There are few limitations of what is possible in the Minetest world, so creativity can run free in an engaging way. Depending on the target audience, and in this case, groups of students this freedom can also lead to potential problems such as users interfering with or destroying others creations either intentionally or inadvertently. Luckily, it is possible to create a server side mod with lua as mentioned earlier, which allows limitations to be placed on the players. A careful balance must be found to prevent players from interfering with others, while still not hindering creativity and taking away from the true power of the sandbox world. It may be helpful to create a list of actions that should be allowed, denied or limited so that you may identify any potential conflicts.Below is a table showing a small set of the things considered when designing the EduCubed mod. The first items on the list to be addressed were the “Limited” use cases. It was necessary to allow users to create and destroy items to build their creation, however this needs to be controlled. Zones for each student group within the class with an impassable boundary were set up. This allows each group creative freedom within their zone and work collaboratively, but prevents them from interfering with other groups. 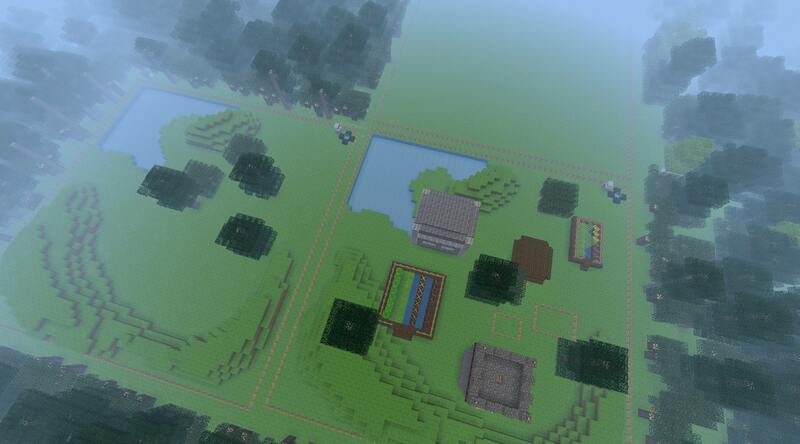 This boundary was made transparent to allow groups to still be able to see what their classmates are working on in the neighbouring zones as well as maintaining the expansive feel of the game world. Login is controlled with a token provided to students. These unique login tokens ensure that users can be individually identified, which then allows them to be placed in to the zone for their group as well as setting in game permissions which prevent them from damaging other players and limiting other game actions such as chat. While it is important to limit the potential for misuse when using a game like Minetest to deliver educational content, it is just as important to maintain a good level of freedom as this is one of the things that makes it an engaging experience.